Well, time to fix the billion issues I have with tile collisions and such. I hope I’m never touching this again. Basically, this top wall is the only time when something is supposed visually overlap it and that’s projectiles and any effects they spawn. But the issue is that it is only projectiles and effects. I hate hard-coding this stuff, but I am not sure how else to solve it. And it gets worse if I add elevation to these to account for being above ground. 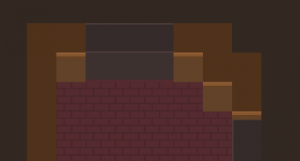 Here, the top wall has almost half a tile leeway for collision, meaning that it collides “mid-tile”, which visually means it hits “on the wall”. Yay! As before, hope I never have to touch this again. In short, I’m no adding any exceptional logic to this. I also had to fix door locking (for when boss battles start) and unlocking, with correct tile changes (since technically tiles have no “memory” of their sprites after/before transformation). Some of the double-door stuff, especially the neighbouring door tiles being a different room/area, had issues, so I had to fix those. It does mean that the doors have to match the walls, but that’s kind of expected anyway from the same room. There will be slight transition weirdness if the neighboring room is a different style. Of course, I’m not going to animate anything at the moment (and probably ever). Anyway, a shorter blog for various fixes that don’t go elsewhere.